To ‘brainstorm’ or to mind map? One of the biggest frustrations with mind maps for me is their weakness in showing something that logically belongs in two or more places at once. The out-of-hierarchy connecting lines just don’t satisfy the need. 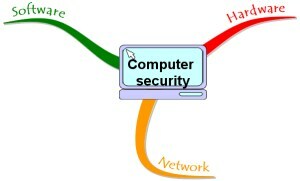 To give an example – if I’m thinking through computer security, I might decide that at the top level there are three topics to think about: Hardware, software and the network. But wait. 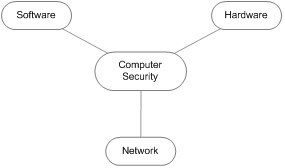 There’s another way to begin a map about computer security: Defences and vulnerabilities. Well, yes, but there are hardware defences and vulnerabilities, software defences and vulnerabilities and … hmm. That’s fine, and plain and simple, and several information mapping packages can make maps like this. But the example itself is simple (so far). Once we go to work organizing real-life information for a serious project, a concept map like this can start to look like a tangled heap of string that a kitten just pounced on. Is there an alternative? Well, yes, actually. Each time we want join a node to a second parent (or a third or a fourth), we can clone it. Not copy it, show two or more instances of the same thing – change one instance and the same change appears wherever the node is cloned. And all instances of the clone carries all its branches. That is how topics having multiple parents are handled in Topicscape. It was suggested for FreeMind as well, and an implementetion by someone not in the development team was published in 2008, but never made it into the main trunk of development, and may not have been a very complete approach to cloned nodes. Whether the patches can easily be applied to the latest version I don’t know. The ability to do this is sometimes very useful indeed, and that makes me wonder: Why isn’t this done in more mind mapping software? Entirely agree with your frustration and wonder if you’ve found a solution or can offer advice. This is how we’ve done it in my own software, Topicscape, as I mentioned in the post. Works well, but other software hasn’t taken up this idea.